“Llareggub” to write home about or “Taergydoolb”? 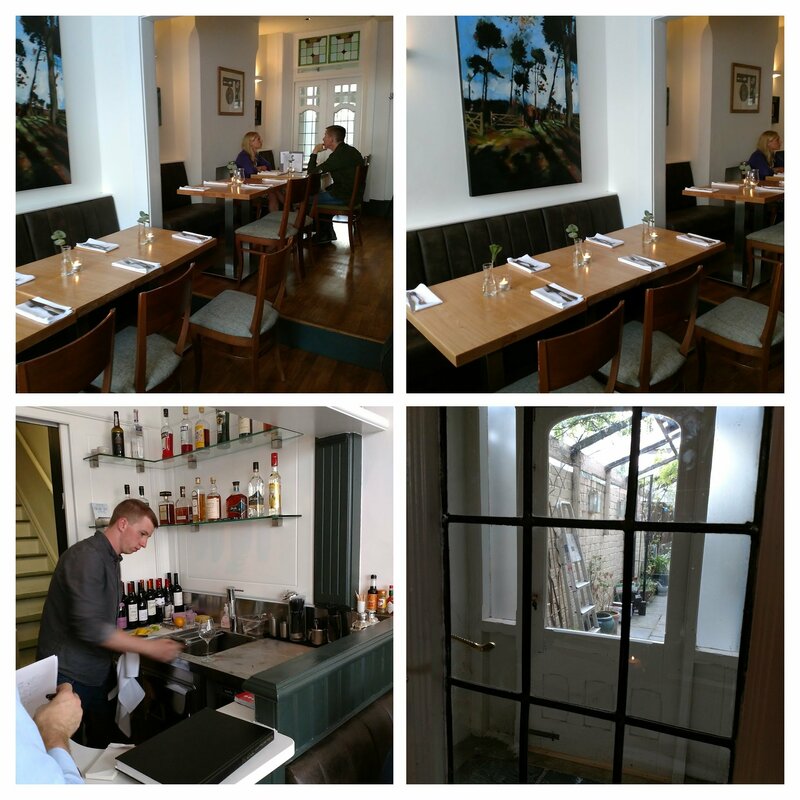 Milkwood, Pontcanna, Cardiff. 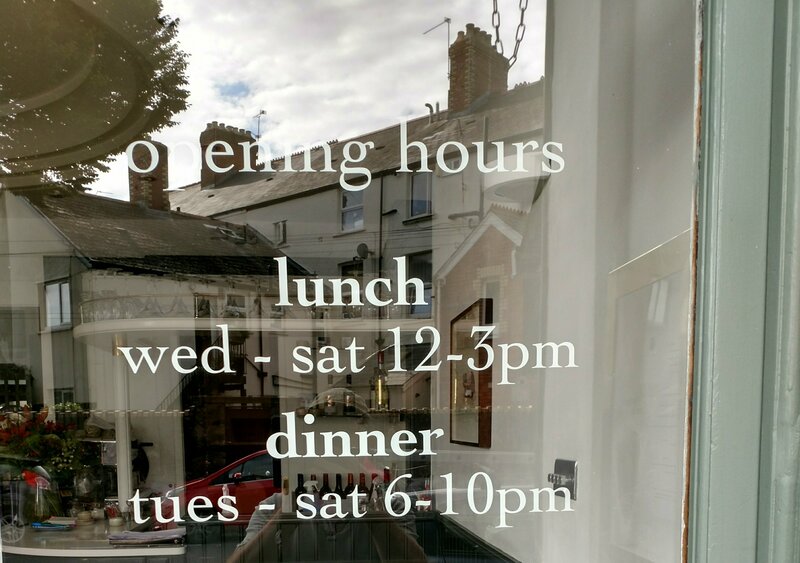 The title is an ode to Dylan Thomas’ “Under Milk Wood” (if you are not a Thomas fan you will need to read the words in “speech marks” backwards), with the Milkwood here being a restaurant that has recently opened in the Pontcanna suburb of Cardiff. The people behind the place come with some considerable pedigree having been heavily involved in the very successful Potted Pig and Porro × 2 (in respect of which they have now sold their interests), as well as still owning the equally successful Landowne and Grange pubs. 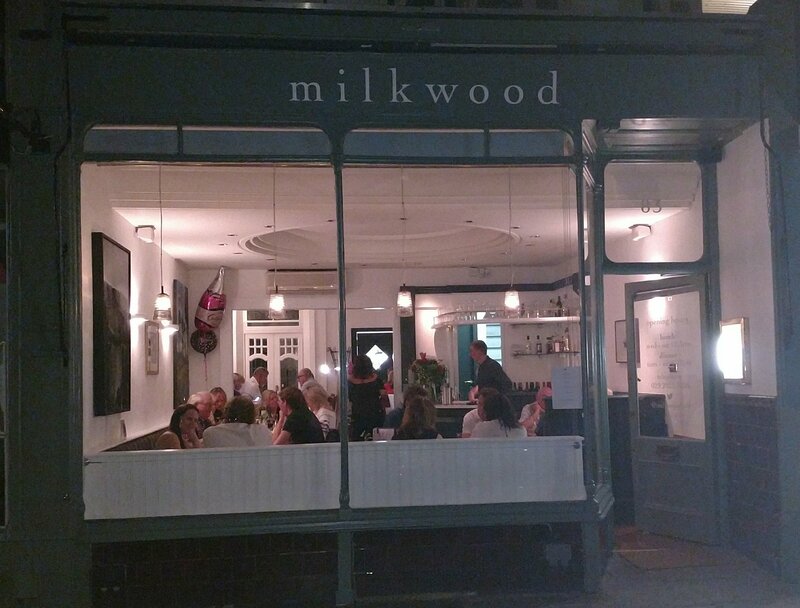 Milkwood would seem to be somewhat of a return to their catering roots for two of the people behind this new venture, as they originally met in the kitchen of the former occupant of the site in the form of Cibo. whilst inside it is quite compact, but cosy and nicely done out. Understated, but refined was my view on the decor. It was quite quiet when we arrived at 7pm on a Saturday night, but soon filled up and was packed when we left. Tap water was brought to the table unprompted which I like and the staff know their stuff and are very amiable. No broom handles up the ….. starchiness here. The menu in short and sweet, with only 4 starter, 5 mains and 3 puds (including cheese). 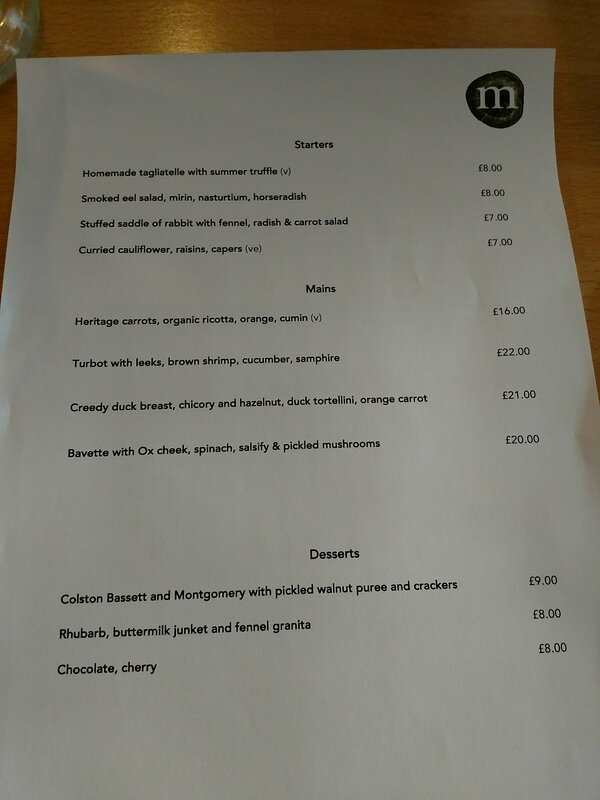 They also have a fixed price Plates du Jour lunch menu – no choice but it changes regularly and looks good value (especially if you add the glass of wine – nice to see reference to a selection of wines included in the offer, but how much is 3 courses with a glass of wine?). I like the brevity of the menu, as to my mind it is better to concentrate on being really good at a few things (cooked to order, using seasonal ingredients and presumably changing fairly regularly and with the seasons) rather than just OK at a lot (menus of biblical proportions always make me highly suspicious). The menu is not your run of the mill stuff by any stretch of the imagination, with interesting use made of some unusual ingredients. Eel is not seen on that many UK restaurant menus (bar from Japanese places – the Japanese really appreciate a good fish and thus love eel), which is a shame as it has a lovely delicate, almost sweet, flavour. I adore it smoked. I was torn between the summer truffle tagliatelle (love the pungent earthiness of truffle and having spied it on the table next to us, with it eliciting oohs and aahs of appreciation from the person eating it, I wanted Mrs. SF to order it – for research rather than selfish purposes of course – but she was having none of it) and the smoked eel salad, but eventually decided on the eel (£8 – something I always go for on a menu if I see it, as I so rarely do). 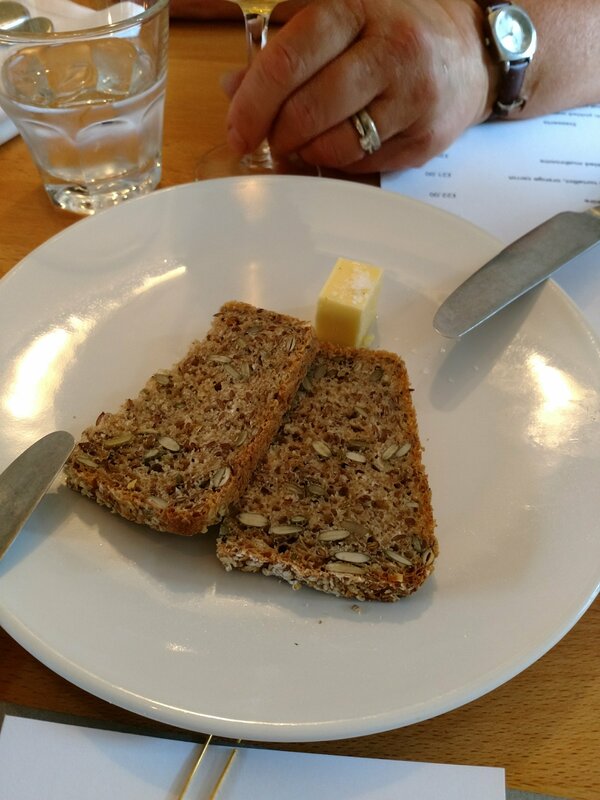 The bread and home smoked butter were both lovely. Liberally dotted with seeds, there was a pleasing fennel hit to the bread (left me wanting more, especially when there was sauce to mop up regarding my main) and a homemade butter, with a subtle hit of smoke and a proper amount of salt (can’t stand unsalted butter). 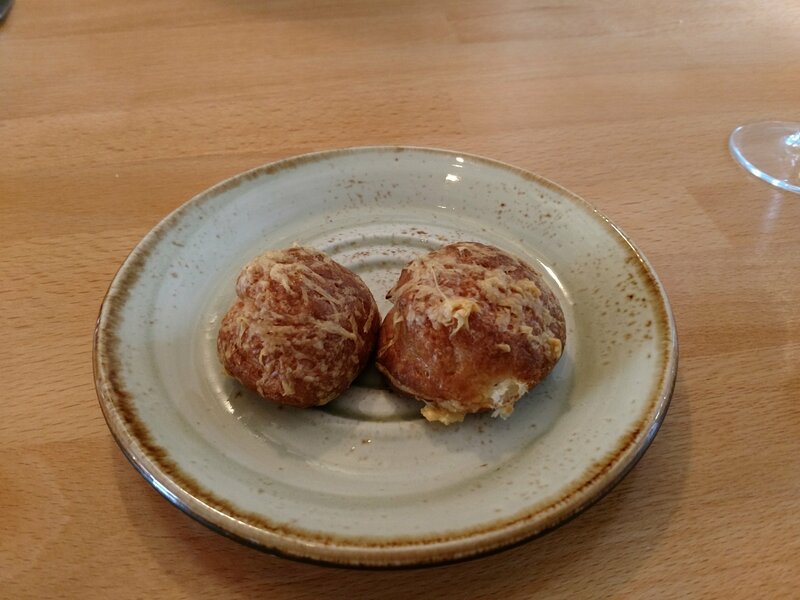 The amuse bouche, prior to our starters, was a couple of lovely cheesy gougères. Light as a feather with a really good thwack of cheese. Good start to proceedings and an indicator of what was to come. On to the starters, smoked eel and horseradish is one of those matches made in heaven. 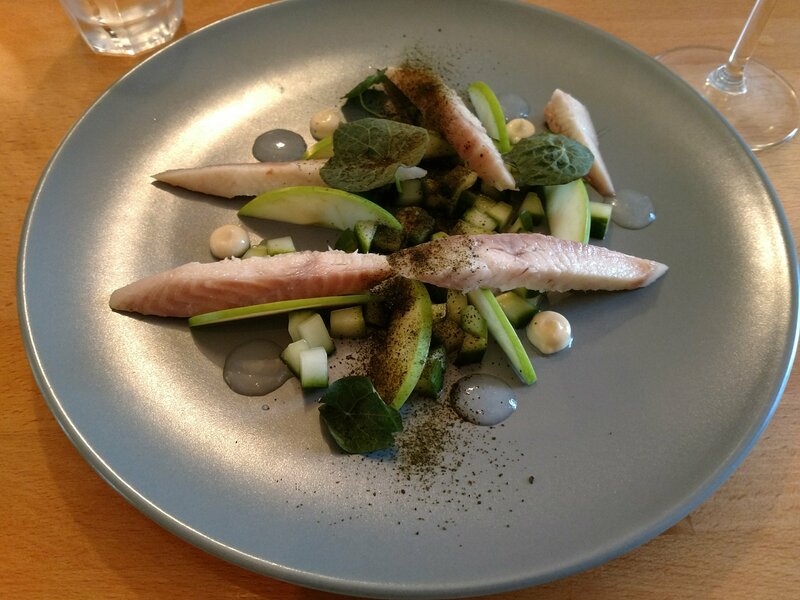 Here the addition of the sweetness of blobs of mirin complemented the delicate smokiness of the eel and also provided a nice contrast to the flavours imparted by the cure applied to the eel prior to it being smoked. The mirin also operated to tone down the nasal clearing quality of the horseradish (as the going says “sweet goes with heat”). Sharp and sour was provided by cubes of pickled cucumber and slices of fresh green apple. Finally the nasturtium leaves added just a hint of bitterness to the dish. Really clever bit of cooking this, applying the full gamut of flavour sensations. It even got a thumbs up from Mrs. SF (who usually turns her nose up at eel). 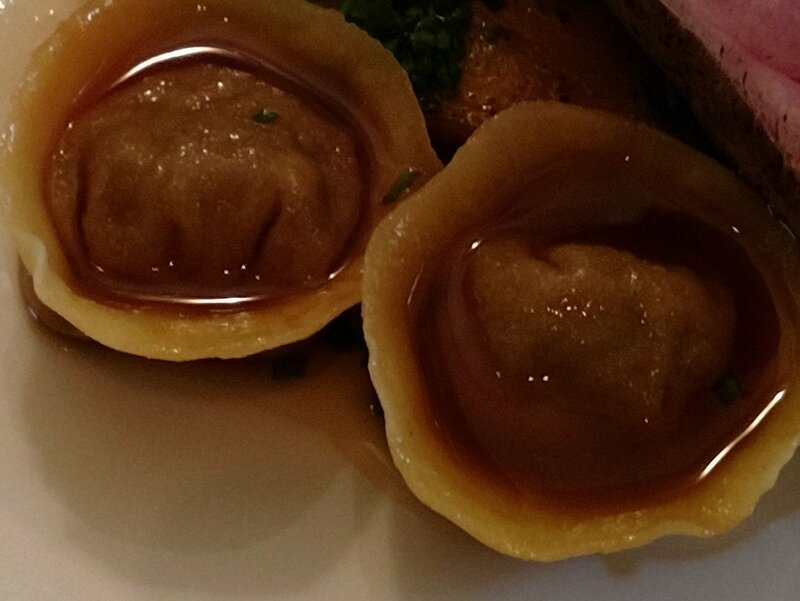 I was really impressed with this dish. 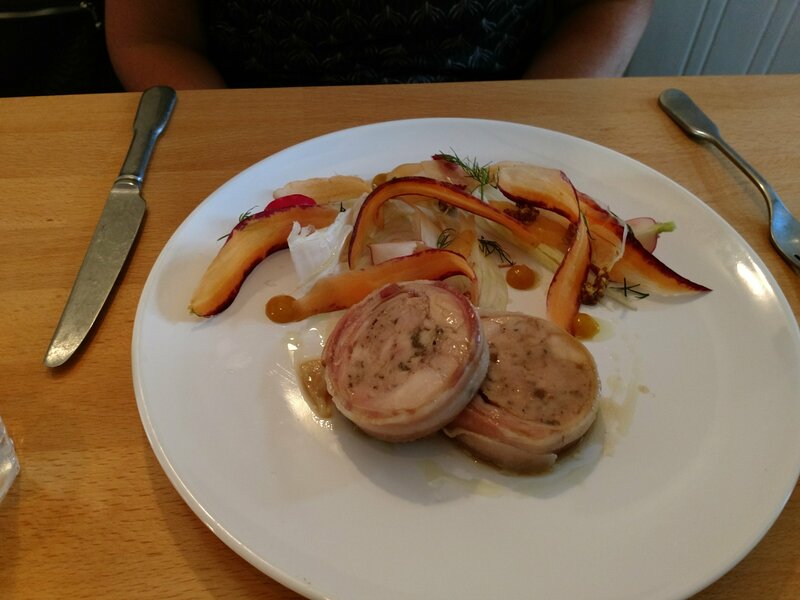 Mrs. SF decided on the stuffed saddle of rabbit (£7) for her starter. Made as a ballotine, the rabbit was beautifully succulent (so easy to dry out rabbit), well favoured with a touch of gaminess. It came with a forced meat stuffing (to which some of the rabbit offal had been added – I think), all wrapped in pancetta. Some lovely fennel and carrot ribbons brought sweetness and anise to the party, which worked well with the rabbit. 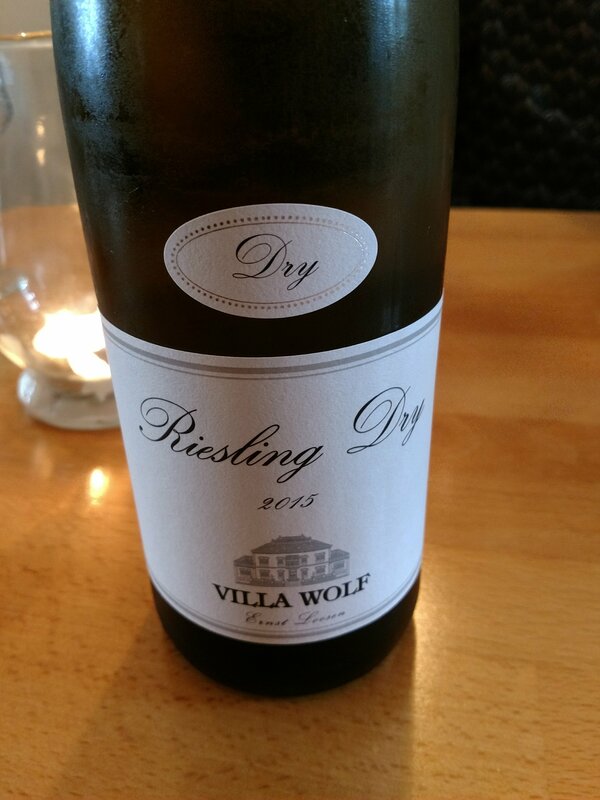 Mrs. SF enjoyed this immensely and from the taste I was given I thought it was first rate. On to the mains, despite there being a choice of only 5, all of them sounded right up my street. This led to a few moments of indecision, but (after Mrs. SF gave me the “get on with it” look) I decided finally on the duck (£21), having toyed with both the turbot and the bavette (nice to see this uber tasty cut used rather than boring fillet – got to eat it rare mind or you may as well tuck into your shoe) and ox cheek options. The duck were cooked absolutely “à point” for me being pink, verging on the ruby (properly rested so there was little leakage), but cooked so the skin was crispy with the fat rendered down properly. Great flavour to the duck, which cut beautifully (very tender and tasty piece of meat). The tortellini were jam packed full of rich duck flavour, with thin pasta and some of the rich, glossy, killer sauce (I think there may have been a drop of either maderia or marsala used to deglaze the pan, on top of a rich base stock, to give the sauce a touch of sweetness) poured into the well on top of each tortellini. The accompanying vegetables were stunningly good, with a beautifully smooth (wouldn’t know a lump if it punched it in the face) puree, a roasted carrot and, the star of the show, chicory with a dusting of hazelnut. The carmelised chicory had soaked up the sauce and its slight bitterness worked a treat with the sweetness of the hazelnuts and the sauce. 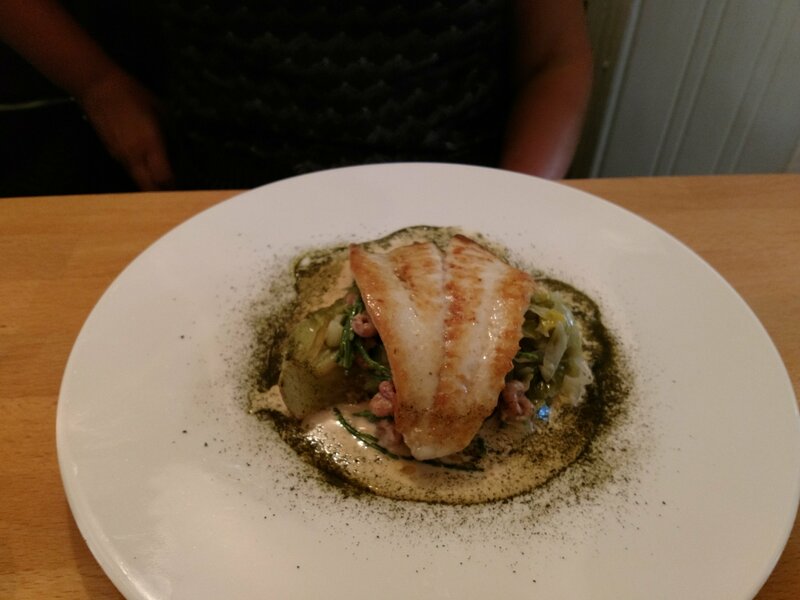 Mrs SF went for the turbot (£22) and there is good reason for it going by the moniker of “the King of the Sea”. It is a beautifully firm, large flaked fish with a pleasing taste of the sea. Rightly beloved by chefs. Here it was perfectly cooked, with a nice bit of colour on top but just the right side of transculent inside. Great piece of fish, nicely seasoned, with a lovely favour of the sea. It came with an excellent sauce, into which they had jemmied a real flavour punch, a scattering of lovely tiny brown shrimps (beautiful and very underrated crustacean these – very much a case of bigger isn’t always better), briney samphire, sautéed leeks and what Mrs. SF described as some seriously good braised greenery (it was lettuce I think). Another fantastic dish (although perhaps just shaded by the duck). On to the puds, the rather blandly named cherry chocolate (£8) was anything but bland in terms of the flavours and artistry on display. I have applied a filter to lighten the pic. as in its original form it was dark food on dark plate ( for the record Mrs. SF is not an Umpah Lumpah). A rich salted ganache contrasted nicely with a refreshing ice cream. 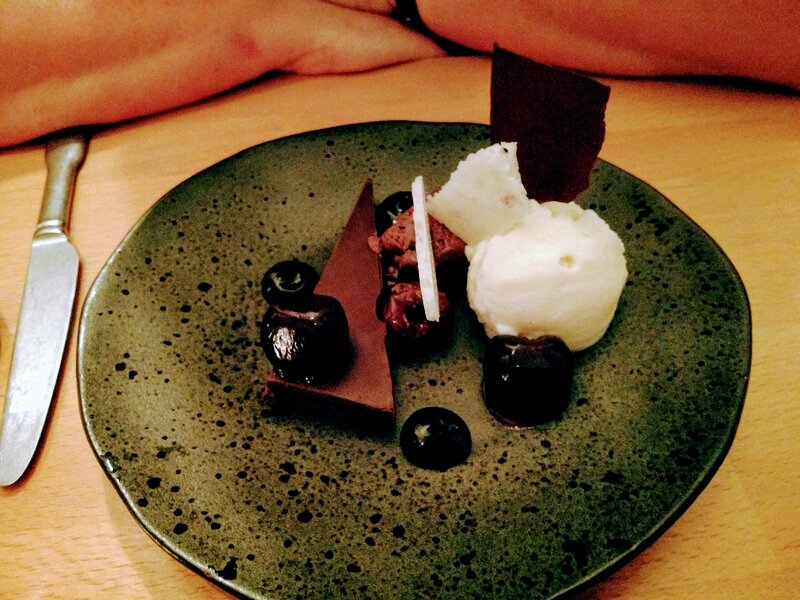 An intense cherry puree and macerated cherries provide both sweet and sour, which worked well with a light chocolate mousse. Texture came from a chocolate tuile and an aerated milk wafer. Another killer dish. 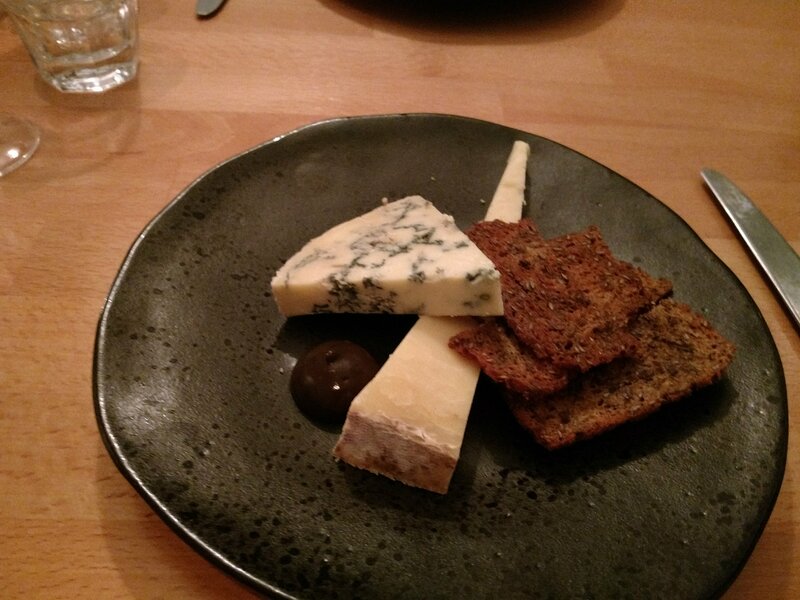 Whilst intrigued by the buttermilk junket and (particularly) the fennel granita, I went for the cheese (£9), which consisted of two substantial lumps of Montgomery cheddar and Colston Basset stilton. Lovely cheeses these, with some very pleasant crackers (I liked very much the fact that they said if we needed any more crackers to just ask). The pièce de la résistance was a super pickled walnut puree. God I need the recipe for that as it was just fabulous with the cheese. The whole thing was big enough for two to easily share it. Lovely as these cheeses were, I think (with the place’s strapline being “an independent modern Welsh bistro”) a Welsh cheese wouldn’t have gone amiss. Minor cheese quibble aside, I couldn’t fault any of the dishes (very unusual for me). On the booze front the only aperitifs seem to be an Aperol and Aperol spritz and, if you dug into the drinks menu, gin and tonics. After checking, then rechecking, the drinks menu for the sherries on offer (not finding any – surely a printing error I thought) I asked if they had any sherries (it was a hot evening and a nicely chilled fino or manzanilla would have been a perfect aperitif – would also have gone rather nicely with my eel or Mrs. SF’s turbot). The answer was a “umm no”. Now regular readers will know I am a real sherry nut and this was an almost “I’ll get my coat” moment. Seriously though, sherry is such a good aperitif and food wine and every half decent restaurant should have several on their wine list (foolish not to, in my humble opinion). 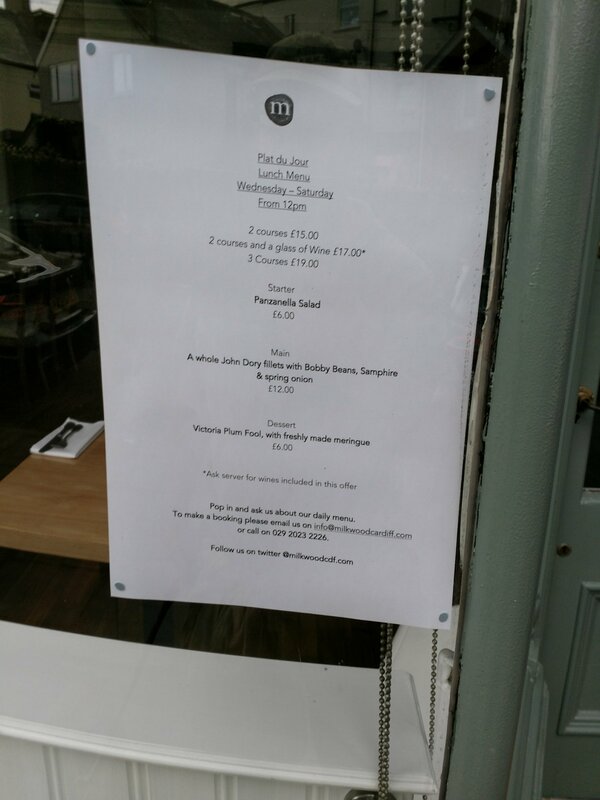 The food here would have paired beautifully with sherry or Montilla – Morales (the other place) wines (a fino with the eel and the turbot, a palo cortado or amontillado with the rabbit and the duck). With the lack of sherry (surprising) or Montilla – Morales wines (much less surprising – but people should really start exploring wines from this DO as, in my limited experience, they can be stunningly good), a trawl of the list turned up (in the dessert wine section) a dry white port from Quinta de La Rosa (£4), a much underrated drink especially as an aperitif. This was a nice dry port with tropical fruit aromas and flavours (predominantly pineapple) served (as it should be) chilled. It would be nice served, through the addition of tonic and ice and a slice, as a long drink. 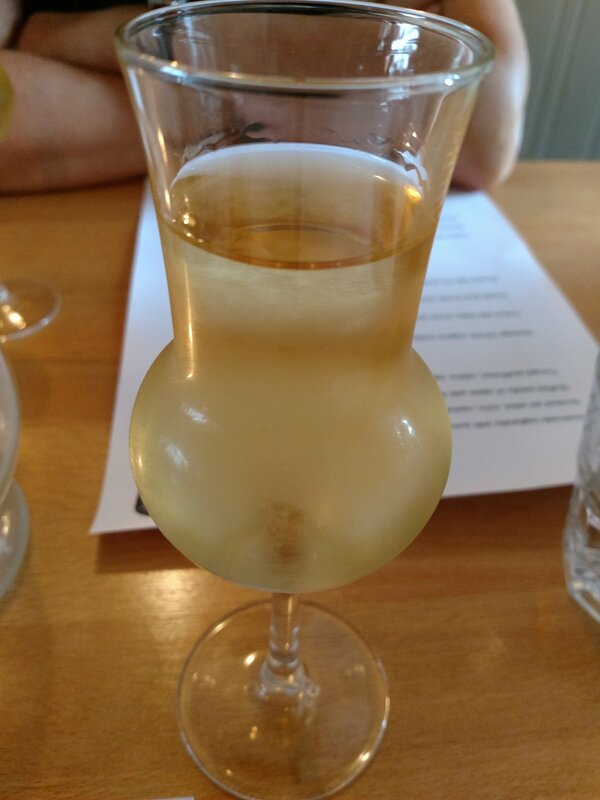 Only problem with the white port was it came in this glass (which I think is hideous). Designed for grappa (with the grappa going in the bowl – no more than half way up – and the chimney bit acting to funnel the aromas upwards and to mitigate the alcoholic heat of the spirit, so filling it up into the chimney defeats the object of its design), this glass did the very nice port no favours at all. The main wine list is short and sweet, but has some decent stuff on it. Nice to see a blanc de blanc, a crémant and an English fizz rather than the ubiqutous prosecco. No Welsh fizz though, which is a shame. The whites are predominately French based, but joy of joy a Pfalz riesling (great food wines) was on the list. 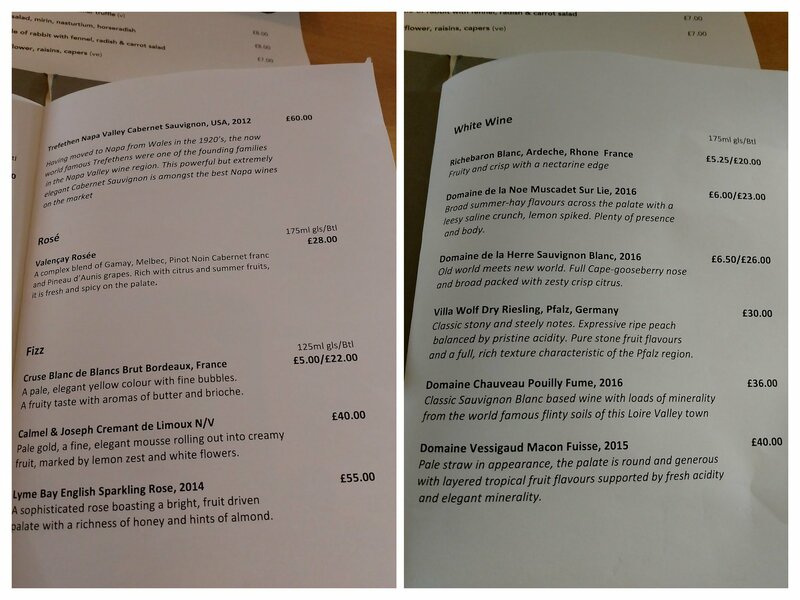 As they have gone down the predominantly French route it was surprising that there was no stuff from Alsace (an area which produces really food friendly wines) on the list. Also it would be nice if they widened the list out, geographically, a bit. 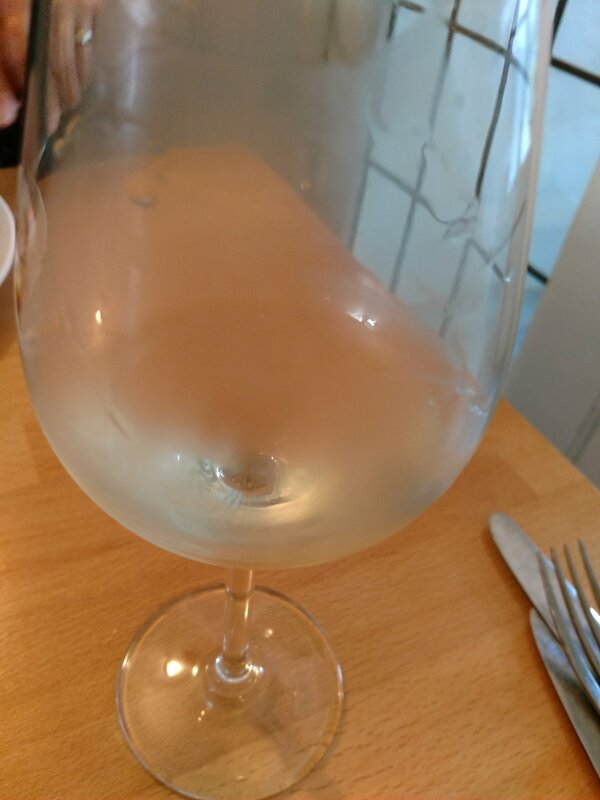 What about a decent Austrian Gruner Veltliner (superb food wine and ideal for the menu here)? 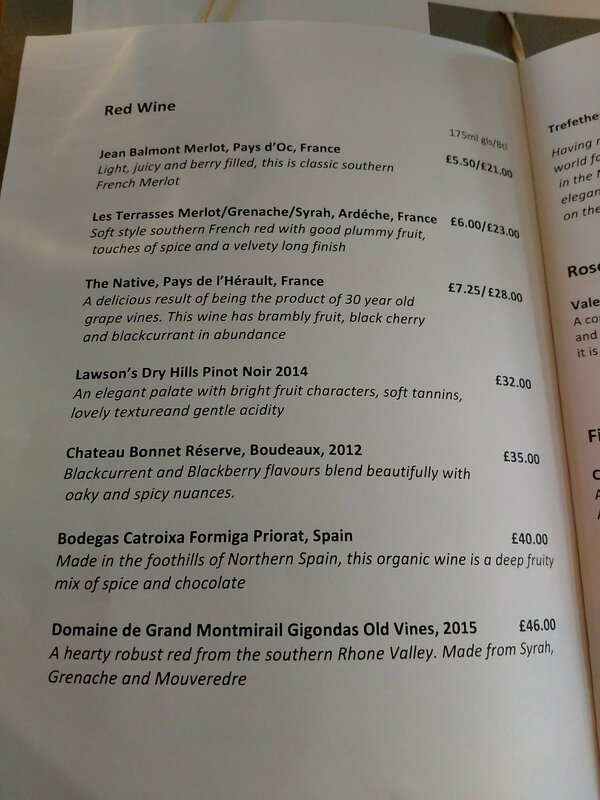 Odd that some wines on the list provide vintage details whereas others do not (can make a big difference price wise). Very decent drop this. Dry with a good slake of minerality and some rather pleasing peach and apricot notes. A nice level of acidity made it pleasantly juicy and very refreshing. Great with the eel and the turbot and enough about it to pair well with the rabbit. It would also have probably stood up to the duck. 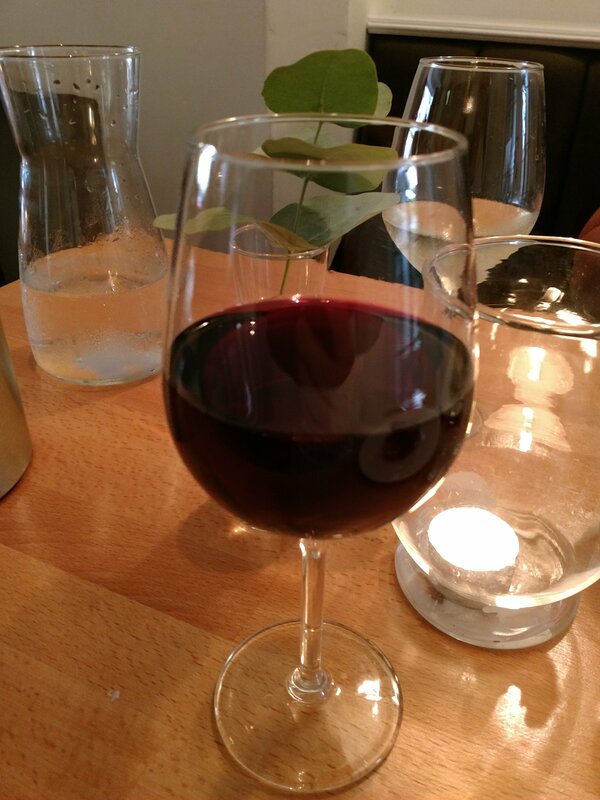 I, however, fancied a red with my duck and went for a glass of the Native (£7.25 ) on the list (a Vin de Pays de L’ Hérault number). Again a nice drop, with bags of dark fruit (think black cherries and damsons) on the nose and palate. It paired very nicely with the duck. A shame in this day and age (with the advances in wine preservation) that only some rather than all the wines are available by the glass. I did rather fancy the Lawson’s Dry Hill pinot noir on the list with my duck (pinot noir pairs so well with duck). Maybe they should think about investing in a Coravin. With the pud and cheese we had a ruby port from Quinta de La Rosa (£4). Very nice rich, dark, sweet (but not cloyingly so) fruits. It (as with the white port) was marred somewhat by being served up in a grappa glass. brought proceeding to an end. 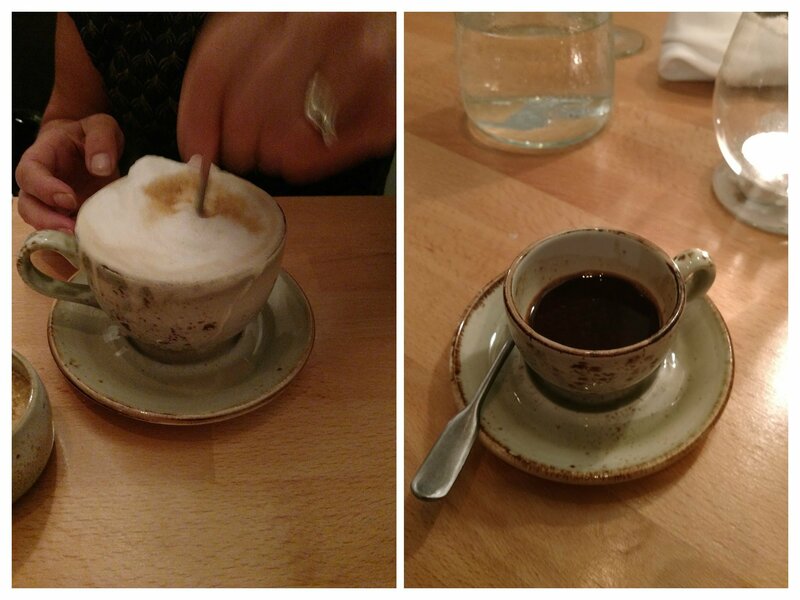 Some petit fours would perhaps have been nice touch with the coffees. Bar from the weird use of grappa glasses (sorry but I think they are horrid things that shouldn’t see the light of day) for both the ports we had and the perplexing lack of even one sherry on the list (come on really – if they do get some on the list please God don’t let it be served up in those grappa glasses), it really was “taergydoolb”. Every dish we had was excellent and this is clearly a kitchen that seriously know’s it stuff. All in all a fantastic addition to the Cardiff food scene. 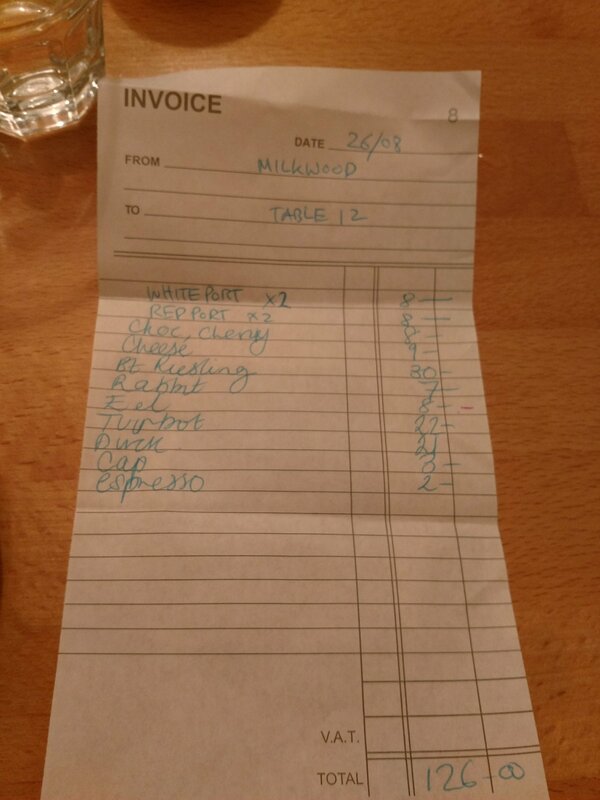 Price wise we paid £126 (sans a well deserved tip) for 3 very good courses and a fair bit of booze. I thought this fair value. Others (J – who went for lunch before my visit – and Gourmet Gorro), whilst loving the food, have questioned the portion size to price ratio. Both Mrs. SF and I, however, were more than happy with the quantity of what we got (looking at the photos in Gourmet Gorro’s piece it may be that they have taken heed of his point and Mrs. SF and I got the benefit of a resulting increase in portion sizes). With what we had, Mrs. SF and I were pleasantly sated at the end of the meal and the bill was in no way excessive in my opinion. Would I go back? Try and stop me! 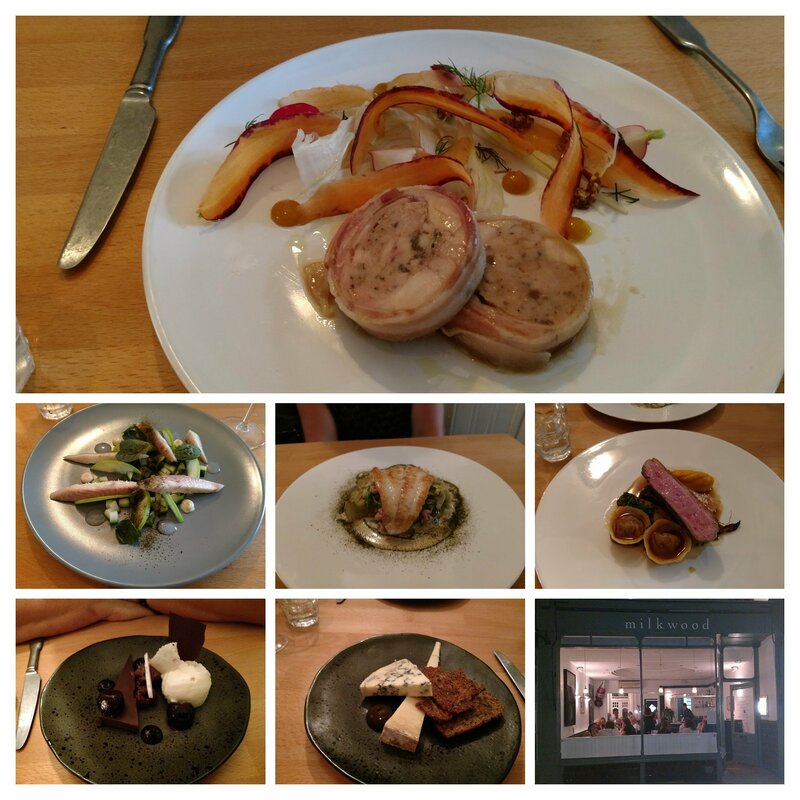 Fabulous food, right up there with the best that Cardiff and surrounds has to offer (Mrs. SF said she preferred it to the Michelin starred Restaurant James Sommerin). Just get some sherries on the wine list and ditch those grappa glasses. Can’t wait to try here! 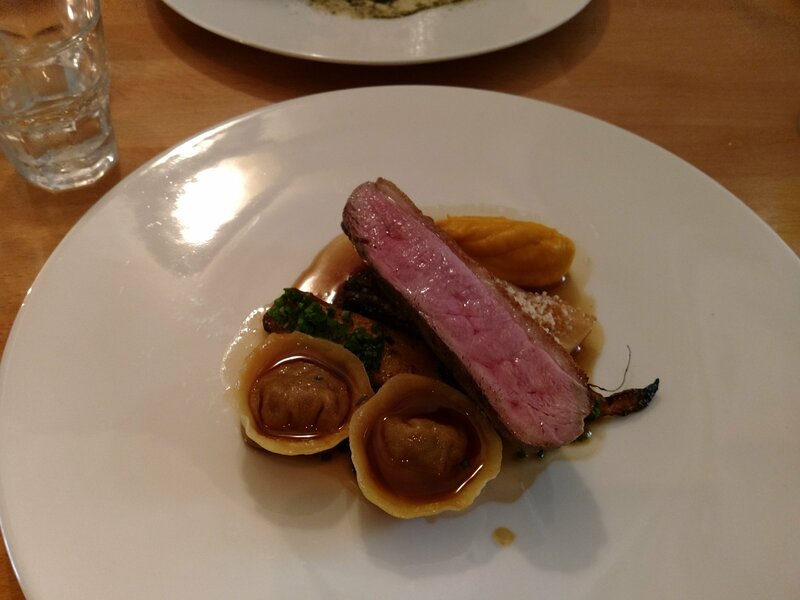 This entry was posted on Sep 3, 2017 by solicitingflavours in Alcoholic drink, Austrian Wine, beef, bistro, Cardiff restaurant, cheese, coffee, desserts, Drink, Dry white wine, Eel, English Wine, Fine dining, fino, fish, Fixed Price Menu, Food, Food and wine products, France, French wine, Gruner Veltliner, Lunch, Milkwood, New restaurant Cardiff, Pasta, Pontcanna, Porro, Port, Priorat, Red Wine, restaurant review, review, Riesling, seafood, Sherry, Spain, steak, turbot, Uncategorized, vegetarian food, Wales, Welsh wines, White wine, Wine, wine mark up, wine pairing, wine pairings.